What will the rabbinic leadership of the Charedi world do? A wave of provocations from the Far Right challenges the very definition of Judaism. Should Yidden in other parts of the community who are far from the battle lines care? It would take a navi to answer the first question. Responsibility for Klal Yisrael and caring for other Jews demands a resounding “yes” to the second. Lots of things are happening in the Charedi world – some good, some not so good, and some astonishingly terrible. The far right of Charedi Orthodoxy seems to be intent on continuing an unrelenting drive to push the envelope and change the way people lead an Orthodox life. The Charedi Gedolim, who in many other ways are models of selfless commitment to ahavas Yisrael, have unfortunately become the charismatic leaders of what is now a movement. They led the campaign to brand a mainstream view amongst Rishonim and Acharonim as kefirah. They have also renounced the Gemara's obligation on a man to teach his son a trade, and on a person to take a lowly occupation rather than to insist that the community supports him, claiming that there is no halachic objection, since Eis La'Asos l'Hashem Heferu Torasecha. They have founded a new system of kollel for the masses without a time limit, which has been perpetuating this derech for a number of years. Charedi graduates have quietly slipped into pulpits around the country. It also sports a sister program for teaching girls that they need to support their husbands - in contrast to the traditional model described in the kesuvah. The Charedim are not the only group flexing Far Right power. When the Rabbinical Council of America (RCA), the rabbinic umbrella group of Modern Orthodoxy worked to standardize giyur procedures for the benefit of future converts, some rabbis on the right were upset by what they saw as a “modernization” of the process, denying them the right to insist upon whatever stringencies they see as appropriate. They founded their own conversion organization, Eternal Jewish Family, which will promote its own competing batei din for giyur, relying on more “authentic” and strict standards they believe are found in certain teshuvos (such as that women must dress according to charedi standards, that one is required to believe that there was no age of dinosaurs, and that Dayanim may not wear colored shirts), ignoring the vast majority of poskim who disagree, and who have disagreed for a century. The children of many geirim are now being sentenced to lives of uncertainty, since the conversions of their parents – whether valid or not – could be questioned years from now, when all that is remembered is that the dayanim who presided over them rejected the standards of the Gedolim. The Far Right does not rely on notoriety alone to capture attention. It makes steady and good use of the pashkevil, as well as the mainstream Jewish press, all aimed at the rest of the Orthodox community, and well beyond. One of its more effective tools is a newspaper called Yated Ne'eman, written by those who insist that nobody may argue with "the Gedolim," while another, The Jewish Observer, has been resurrected under the ironic name of "Dialogue." Maintaining public visibility as denouncing many traditional Jewish attitudes produces much thunder and attracts significant media attention outside the Orthodox world. This is designed to increase pressure on mainstream rabbis, and move the majority of the community to view its changes as acceptable. People who lack the background in learning to analyze the arguments on both sides see a group of “authentic” rabbis making a strong stand, which seems like a good thing to them. Then they note a different group of “reactionary” rabbis who insist on scholarship and reasoned arguments. This generates enormous pressure on the center Orthodox to make concessions so as not to alienate growing numbers of their congregants. Years ago, the Far Right sought innovations like making chumras into the norm, and making it a bedieved to work for a living. Those changes are so commonplace that they have lost their cachet. Today the push is for even acknowledged non-halachic views of Rishonim and Acharonim to be "paskened" no longer permissible to be taught, and for traditional family models, whereby the husband works and supports his family, to be looked upon as bedi'eved. To many, the Charedi axis looks at halacha in so many of its published psakim and communally dictated standards in a manner fundamentally different than the rest of us. It senses where it wants to go, and then looks for any vague aggadic statement within rabbinic tradition to justify it – but without having to offer any arguments for why their shitah is preferable or even defensible. Any shitos can be rejected on an as-needed basis. Absent is the sense of looking for an objective truth. That quest permeates hundreds of years of halachic literature: weighing all the views available, and only relying on those best supported by the evidence of the words of the gemara and rishonim. • Very few on the far right can show any competence with theology, with the broad range of views in the Rishonim and Acharonim, or familiarity with wider society beyond the beis hamidrash. • In traditional halacha, very serious questions are ruled upon in teshuvos, which provide the rationale for the answer. The right balks at this, seeing this as an affront to the untouchable status of the Gedolim, and prefers to issue decisions without justifications. It also believes that no views of anyone who is not part of the "Charedi Gedolim club," should have any status. • In traditional halacha, the views of Rishonim are accorded great respect. In Far Right halachah, these are freely dismissed and condemned on the bizarre grounds that "they can say it, we cannot." What should the Orthodox rabbinate do about the Charedi far-right? The question threatened to split the Orthodox world after the bans on Kamenetzky, Slifkin and Lipa, the silence on Tropper, the neglect of the abuse issue, and the economic collapse of the Charedi world. If even the gemara can be rejected in the name of a claim of it being "emergency times," where will this all lead? Given enough time (and enough headlines), can any shittah be paskened away? Even if no further changes are contemplated, doesn’t the approach suggest an understanding of mesorah fundamentally at odds with the rest of the Orthodox world, whereby mesorah means "what we do" as opposed to "what was traditionally done"? It is difficult not to think of the dispute between the Wurzburger Rav and R. Samson Raphael Hirsch. When Orthodox Jews were given the right by law in 1876 to withdraw from the community structure dominated by Reform, Rav Seligman Ber Bamberger strongly that they should not. Jewish unity should be maintained, so long as the observant did not have to compromise with their observance of halacha. Rav Hirsch, however, felt that it was imperative to do so. No one can say who was objectively “correct” in that dispute, although the last generations have looked favorably upon Rav Hirsch’s bold decision. Some argue that today’s agonizing choice is different. In Germany, the lines of demarcation between Reform and Torah Judaism were clear. Today, many fear, those lines have to be drawn. To avoid erosion of Torah values and practice, the rest of the community must define the approach of the Far Right as so different, that it can no longer be called traditional Judaism as the rest of us know it. Why should the more traditional part of the community care about issues completely off its radar? The problems with which the Charedi world is grappling are just not relevant to communities much further to the left. In fact, we should be able to identify several reasons. Firstly, the impact upon areas of Orthodox cooperation will be enormous. If the Far Right grows stronger in untethering itself from both traditional hashkafos and accepted protocols of determining halacha, there will almost certainly be a reaction in the rest of the Orthodox world. Lemegdar milsa, to draw clear lines of differentiation, the traditional community will move in the opposite direction to oppose changes it sees as dangerous and illegitimate. We will drift even further apart. Cooperation in many areas – education, kashrus, kiruv, gerus, political advocacy – will be jeopardized or eliminated. Much of the left will argue that if Charedi Judaism can tolerate such aberrations in its midst rather than expelling it, than they cannot trust or continue to deal with the Charedim – especially if a Charedi presence becomes mingled with the Modern Orthodox representation in common enterprises. Cooperation that took decades to accomplish may quickly unravel. Minimally, HaKadosh Baruch Hu expects our deep concern about wide-scale counterfeiting of Torah, even if it does not impact upon us directly. We should be prepared to show it. Many charedi rabbis are showing extraordinary mesiras nefesh in refusing to compromise on what they received from their rabbeim. If you learn of a charedi mara de-asra in your community who is valiantly holding a line against incursions from the Far Right, consider offering some chizuk. Let the rov know that you generally daven elsewhere, but admire his tenacity in standing by the Torah while it is under assault. Let him know that while some people think that people’s Yiddishkeit is defined by what they wear on their heads, you believe that what they carry in their heads is far more important. And in that regard, we are much closer to each other than they can ever be to the Far Right. I see that there is a difference between the situation in the US and in Israel. In Israel, the split between the Haredi and National Religious communities and in their Rabbinical leadership occurred years ago, so I, as a RZ, am not affected by the extremists movements in the Haredi world. Yes, there are problems in the "seam line" places like Ramat Beit Shemesh where there are confrontations like with the Orot school. From what I understand, the police finally got involved and that helped (the new police commander Danino seems to be aware of the negative views most of the public has of the police where the perception is that police spend their time going after "soft targets" like basically law-abiding citizens while staying away from enforcing the law in tough sectors like organized crime, the Arabs and the extremist Haredim). The National Religious Rabbis seem to have more self-confidence than their MO counterparts in the US. A good example was when the Haredim got control of the Chief Rabbinate and they threatened to abolish the "heter mechira" for Shmitta year (selling the land temporarily to allow continued agricultural production during the Sabbatical year) a group of RZ rabbis said they would organize a private group that would organize the "mechira". The Chief Rabbinate capitulated and agreed to continue it. I believe this extremist element will end up destroying itself but it will take time. Surveys in Israel show a lot of young Haredim are open to serving in the IDF and getting an academic education. This exposure to the outside world will only increase the extremism of the fringe groups, but there will inevitably be a reaction from the moderate Haredi majority. We must view these developments in historical terms. After a couple of hundred years of secularization, there was a return to Judaism following the HOlocaust and the rise of the state of Israel. Now the pendulum has swung too far in the direction of extremism so there will be a correction in the other direction. We must command and support brave people like Rav Slifkin who are providing the intellectual base for this necessary correction. This is an excellent analysis of the threats to Torah Judaism from the right. Unfortunately there doesn't seem to be an obvious solution to the problem, but hopefully essays like this will further encourage debate and discussion amongst us who are 100% comitted to Halacha, but want our own religion back. As always, an excellent sad/funny analysis of the situation, and a very good response, lav dafka to Rabbi Adlerstein's article - Rabbi Adlerstein certainly provides a voice of reason on most issues, whether one agrees with him or not - but to the common tendency one finds in the haredi world to delegitimize opinions and hashkafas to the left (but almost never to the right) of what that world considers normative. On the other hand, I think Y. Ben-David has a good point about confidence. Perhaps one of the problems in the Dati Leumi and Modern Orthodox worlds (two different worlds, with some similarities, but many differences) is a lack of confidence and an over-sensitivity to what the haredi world thinks of them. I've lived in both worlds, and believe me, most haredim are not sitting around worrying about what some dati leumi rabbi said yesterday, or whether the dati leumi rabbis condemned or failed to condemn some action by settlers or whoever. The Yeted and other media outlets may do this for propaganda purposes, but not the general public. Most of them just don't care, and we shouldn't care so much either. Instead, we should build our own hashkafas and look to our own rabbis and organizations, such as Tsohar. Let the haredi world deal with its issues, and let the politicians and rabbis fight the battles, such as the conversion and the shmitta battles. Not that we shouldn't take an interest in these issues - some of them, like conversion, are vitally important - but I think we should emphasize and build our own hashkafas. What is valuable about Rabbi Slifkin's article is that it reminds us that one can just as easily, or more easily, deligitimize many haredi hashkafas as they can do to those towards the left side of the Orthodox spectrum. Reminding ourselves of this should give us more confidence in our own hashkafas, and our own rabbis. I think the terms "right" and "left" in politics originated from the seating arrangement in the French Parliament in the early 19th century, and they have certainly been extremely overused and made ever more empty of real content since then. Can't we find some better terminology to discuss differences in approaches to Judaism? Good point, fsy. Personally, I've tried to think of other terms, and can't - any short terms that I can think of (machmir/makil, modern/traditional, liberal/conversative come to mind) are so over-simplifying, and so play into misleading generalities, that I think I prefer right and left, even though, or maybe dafka because, they have nothing to do with anything in reality. Maybe we should avoid short labels altogether. Another issue which Rabbi Slifkin should have mentioned is the rapidly increasing tendency in the Haredi world to deligitimize any media other than the official party organs, such as Yated. Maybe he doesn't even realize this, but there is an active campaign going on right now against even such magazines as Mishpacha, and certainly against any frum Internet sites. The financial success (or at least survival) of these media is clear proof (if one needed any) that there is a huge element, maybe the majority, in the Haredi world that does want a significant amount of openness, but a small number of people are controlling things. I think most people would find this issue much more 'live' than something like conversion, which affects relatively few people practically. I agree with your concerns. I am not convinced, however,that (relatively) left wing segments of orthodoxy will respond exactly in the way that you describe. The principled response would be to publicly decry these innovations as going against Torah, and perverting Judaism. Unfortunately there is also a sizeable segment of more left leaning segments of orthodoxy that either: (1) will not publicly condemn this segment of Judaism, because they may belong to chareidi communities themselves, albeit holding more moderate perspectives, and fear social reprisal, or (2) shrug off far-right lunacy, not based on any love for Torah, and a desire to defend Judaism in a principled way, but because Judaism is more of a social thing for them anyway (orthoprax, and segments of modern orthodoxy). In other words, the former group lacks the resolve, and the latter lacks the belief. Apart from having financial support withdrawn from institutions that support such ideologies, they must be attacked as advocating values that are contrary to Torah Judaism (as you have done). This needs to be hammered home, and is incumbent upon all who have a public forum to express this view. It must be repeatedly demonstrated that these people in fact hold Jewish tradition in contempt, by at times altering the masorah, or declaring views derived from the masorah as downright heretical. Once the facade of their representing "authentic Judaism" crumbles, their legitimacy will crumble as well, but again only for those who are inclined to care, and feel somewhat sheltered from social reprisal. "Another issue which Rabbi Slifkin should have mentioned is the rapidly increasing tendency in the Haredi world to deligitimize any media other than the official party organs, such as Yated. Maybe he doesn't even realize this, but there is an active campaign going on right now against even such magazines as Mishpacha, and certainly against any frum Internet sites." Actually there is some grass roots organization that seems to be sick of Yated'd hedgimonal b.s. 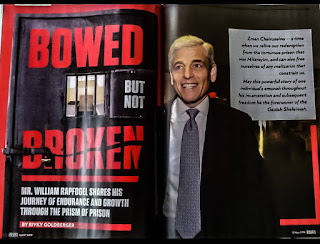 Recently after they tried putting the squeeze on mishpacha magazine, they called for Yate to be put in herem for spreading lashon hara against other Jews. They also did some sort of expose on the lifestyle of the editor which seems to contradict the anti materialism that he seems to espouse. How about the greatest danger stemming from the far-Right: Their position on reporting child-molesters. Far right? I strongly disagree with you calling the subjects of your article that. historically, it has been the Left (politically) who has tried to impose their way of living and declare there is only one way, their way. I totally agree with your article, I just think you've got your left and right mixed up. unless you hold that the polarity is reversed somehow in religious matters. A lot of people seem to be missing the point that I simply cut-and-pasted Rabbi Adlerstein's article and changed a few words. Read the original! I got it, and it was brilliantly done. My comment on "right" and "left" applies just as well to the original. Far Left of the Modern Orthodoxy and the Far Right of the Charedi world. The Far Left is still an extreme in the Modern Orthodox world, both organizationally and in terms of numbers and influence; the Far Right is increasingly the mainstream of the Charedi world. Therefore, I think R. Natan's version of the article is even more relevant than R. Adlerstein's. They also did some sort of expose on the lifestyle of the editor which seems to contradict the anti materialism that he seems to espouse. This kind of thing seems so universal that it's hard to see how it surprises anyone anymore. This seems like as good a place as any to stick in my 2 cents worth about what seems to me to have been a serious tactical error on the part of "Modern Orthodoxy" or whatever you want to call the segment of Jewry which wants a more open, yet halachically serious approach to Torah. A few generations ago, a decision was made, explicitly or implicitly, by the MO to abandon any attempt to adhere to a "Jewish" appearance in dress. It is totally irrelevant whether the "Haredi" dress code (for males) is in any way authentically Jewish or traditional; the point is that it gives a very strong impression of authenticity to its adherents when compared with MO men (even many Rabbis) who generally dress exactly like (respectable) non-Jews plus a kippah. This decision, made in the middle 20th century for some reasons which made perfect sense at the time, is definitely harming Modern Orthodoxy's claim to authenticity today. I don't know what can be done, but I think it's worth being aware of the issue. about how haredi they are and start worrying about how frum they are. There is nothing more "Jewish" than kippah and tzitziot. That is a matter of halacha. Kapotas, black hats and the rest are NOT specifically "Jewish". How do I know? Moshe Rabbenu and the RAMBAM didn't wear them. Were they "Jewish"? Why is going around like a well-dressed New York businessman of 1947 "Jewish"? Yasher koach, R' Natan, for a most appropriate rejoinder to RYA using his own language but directed at the opposite end of the Orthodox spectrum. I agree with all the sentiments even if I wouldn't necessarily use the same (RYA's expressions). I don't agree, however, with the implication in the forward that those who disdain RYA's polemic against R' Avi Weiss and co., but support this post are being inconsistent. No one, that I know of, in the Orthodox left claims that the yeshivish Hareidi world should not be considered Orthodox. LWMO understands perfectly well that what they advocate represents a change of attitude and behavior from a traditional model even if some historical precedent can be found. It is the yeshivish world that pretends that they (and only they) are the upholders of tradition - even as they innovate stringency after stringency, and dismiss the views of Rishonim that are unpopular in their worldview. It's a shame that even such normally moderate voices in the Hareidi world as RYA feel the need to attempt to disenfranchise those they consider to their "far left". Such polemics will not cause LWMO to reconsider its stances, and I doubt that RYA will have much influence on Hareidi attitudes. They already consider MO in its various manifestations as 'treif pasul'. Nor do the right leaning rashei yeshiva in YU need RYA's support in their stance against LWMO leaders and ideology. I see RYA's article more as a self-defense (see, I too disdain LWMO) than as an attempt to influence the Jewish world. Our first step has to be one of attitude. We need to make “change” at least a possibility, not a dirty word. Specifically, we need to turn the volume down on conformity, raise it on diversity, and alter the structure of community institutions to work with these changes." Those quoted sentiments would be heartily seconded by the LWMO who attempt to put it into practice. Thanks, this was absolutely brilliant! This is one of your best posts on this blog. Kudos on a spectacular piece of quasi satire that hits the nail squarely on its head. A few generations ago, a decision was made, explicitly or implicitly, by the MO to abandon any attempt to adhere to a "Jewish" appearance in dress. What exactly was the "Jewish appearance in dress" a few generations ago? A yeshivah student wore a suit and hat with a color other than black (black was reserved for Rabbis). George the non-Jewish bank clerk wore the same thing, sans skull cap. Nonetheless, I appreciate that point that the MO world is not sufficiently accentuating its Jewishness in a public fashion. > A few generations ago, a decision was made, explicitly or implicitly, by the MO to abandon any attempt to adhere to a "Jewish" appearance in dress. It is totally irrelevant whether the "Haredi" dress code (for males) is in any way authentically Jewish or traditional; the point is that it gives a very strong impression of authenticity to its adherents when compared with MO men (even many Rabbis) who generally dress exactly like (respectable) non-Jews plus a kippah. It’s a false sense of authenticity. Jews used to always “dress exactly like (respectable) non-Jews” (and it’s relatively recently, too, that they started wearing a kippah). We can declare, loudly and often, that cosplaying 19th century Poles and 1940’s businessmen does not make one more authentically Jewish, and is in fact ridiculous. I know that RYA claims he was writing the piece on behalf of RCA Rabbis but when you look at his own comments on Cross-Currents he comes off as fanatical and even unhinged writing about "screaming" at people for not recognizing that YCT is "counterfeit" Judaism. Assuming that RYA is a sensible person, the only explanation I can give for his conduct is that he imitated the Rosh Yeshiva who tries to indoctrinate his students on a controversial point by hectoring them and appearing insanely angry. The RY is trying to send his students the message that if this holy man is so angry there must really be a serious problem! But does RYA not realize that anyone with an ounce of self-confidence and self-respect will not be swayed by these antics and will regard his tirade as simply reflecting RYAs poor judgment and fanaticism? I've been involved in mediating various disputes, and if there's one thing I've learned, it's that matters are not helped when people even minimally exaggerate or misrepresent what others said. Rabbi Adlerstein did not write that one should "scream" at people. And whether one agrees or disagrees with what he wrote, in my view he does not come across as "insanely angry." But the point of this post is not to discuss Rabbi Adlerstein's article, and so I will not post any further comments on that point. "And in time, the arguments must be offered if the battle is to be won. Our first priority is to let people know that the work of the Far Left is treif and fraudulent, and that they should stay away if they are at all interested in Mesorah. Later there will be time for scholarly papers." Yes, I checked it before writing my comment. A welcome slide to the left has commenced which will hopefully be accompanied by a love of truth as opposed to that which is expedient and\or politically correct. It has been known for years many Rabbis and Scholars believe it is the far right Haredim that are in fact leaving normative Judaism behind and are becoming a seperate sect altogether. The one's who believe legit converts and their off spring are in question, along with other reasonable known facts are the one's who left Judaism. Maybe it is they, who should not be considered Jewish. Lastly the rest of Klal Yisrael need to stop paying attention to them or giving them credit they don't deserve. I understand your desire to give the benefit of the doubt to a "beloved mentor." This is admirable. But Emes demands that we acknowledge the facts. RYA was used by certain cowardly RCA members to attack YCT. Unfortunately, RYA *willingly* went along with this and as his comment shows got swept up in hateful rhetoric (I don't see how calling YCT --which he calls the "Far-Left" "treif" and "fraudulent" can be interpreted as anything other than hateful). I understand if you do not wish to post this comment. But we must be intellectually honest here, despite your personal relation with RYA, whom I am sure has been wonderful to you. I think that much alternative medicine, and its practitioners, are fraudulent. Is that hateful? Anyway, can we have this discussion off-line? Please email me. I essentially agree with everything Rabbi Adlerstein writes, but disagree with this post of yours (although I'm not a charedi). I strongly disagree with the implicit comparison between charedi innovations and left-wing fringe innovations. I recognize that you said you don't dispute what he wrote, but you still seem to feel that charedim fall into the same boat. I don't think that's correct at all. Charedim are at least in principle following genuine talmidei chachamim, who are well aware of principles of halacha and Jewish tradition and intend only to maintain both. Charedi positions on earning a living vs. working, on the age of the universe, etc. are debatable, but clearly defensible within the framework of traditional sources. Charedim tend to deny the legitimacy of alternative interpretations, and publicly act as though their innovations were really the way things were done all along, but there's nothing inherently wrong with that. As you often point out, the Rambam did exactly the same thing. He imposed his own viewpoint on Chazal and branded anyone who disagreed as a heretic. Such strategies are obviously not appreciated by those of us who get labeled as heretics, but they serve a legitimate purpose in maintaining social cohesion, and are rooted in Jewish tradition. On the other hand, the left fringe is characterized by their complete disregard for real limmud haTorah and talmidei chachamim. There is no one within Avi Weiss' camp who is a recognized posek, in the sense that a large number of well-educated rabbis ask him for psak on difficult issues and then follow it. I haven't heard anyone dispute that the rigor of YCT's curriculum is a joke compared to RIETS or any other reputable semicha program. They ordain rabbis (or maharats) who don't know enough to pasken more than basic she'elos, who then make up innovations with no more than superficial grounding in any traditional sources. Talmidei chachamim are by definition those who really understand the Torah, and disregarding them is nothing less than disregarding the Torah. The only difference between Avi Weiss' followers and Conservative Jews is that the former want to retain some recognition by mainstream Orthodoxy, so they keep their changes moderate enough that they aren't openly cast out by the Modern Orthodox leadership. Witness how Avi Weiss ordained Sara Hurwitz, then backpedaled as much as necessary to minimally appease the RCA (by promising not to ordain any more women). Nothing I've seen suggests that the goals, motives, or beliefs of Avi Weiss' followers differs qualitatively from those of the Conservatives in the slightest, even if they're more moderate. None of this applies to charedim, and I don't think the parallel is at all sound or fair. Although we don't agree with or follow the charedim, we cannot legitimately condemn their hashkafa or lifestyle as unfaithful to the Torah. The left-wing extremists that Rabbi Adlerstein writes about are abandoning Torah values wholesale to suit their political needs, and their ideology cannot be considered any legitimate form of Judaism. Why call them "Far-right" Is their another word you can use because I consider myself "far-right" as well, but when I think of "Right" or "left" I think of politics and not this. Hi Rabbi Slifkin, as far as I'm concerned, this is the best post (and there's a bunch of great ones) I've read on your blog. In my amateur opinion, I think the problems facing the charedi world and left wing modern orthodoxy might be solved in large part if the great majority of observant Jews held that the Mishneh Torah was binding on all Israel. Under this approach, observant Jews seemingly would have less leeway to innovate their own positions (extreme right or left) based on their understanding of the oral law because there would be far less post-Talmudic halacha to justify those positions. While I recognize that even the Mishneh Torah can be interpreted extreme right or left, I think that compared to the current situation, a "Mishneh Torah only" system of halacha would still be preferable to the fragmented situation that exists today. In addition, such an approach would shatter the current charedi culture that justifies its full time gemara learning on the basis that the Talmud is immense and requires full time study in our intellectually weak generation. Just a thought. At any rate, please keep up the great work and may you be sealed for a great year! There seems to be somefusion here, which I didn't understand when I first read Rav Slifkin's piece. I draw a distincition between those who are pushing the limits of halacha (e.g. the radical Orthodox feminists) and those who are open-minded in Hashkafa terms, such as those who have no problem with evolution or support the "New Tanach Studies" from Michlelet Herzog and who have no problem using modern historical and archaeological work to come to new understanding of the TANACH. I don't see that the two are connected, although Haredim extremists do seem to associate the two. Am I correct that Rav Adlerstein was reallhy more concerned with the first group more than the second? I'm getting tired of those who malign LWMO leaders and institutions based on polemical articles they have read. I know that gemara study is taken seriously at YCT, and students are tested on being able to study gemara (make a leining) independently. They are also tested on both the quality and quantity of gemara studied on their own. The rabbinic students at YU may have spent more hours in gemara studies than the YCT students, however the latter appear to have a more intensive training in halachic texts. In general, YCT is geared to providing the tools needed for a practicing rabbi. They devote far more time and resources to vital rabbinic functions such as counseling than do other Orthodox rabbinic institutions. As to the quality of talmud scholarship at YCT, Rav Dov Linzer, the dean and rosh hayeshiva of YCT may be the equal of the most brilliant YU rashei yeshiva. His character, from my observations, is, if anything, at least equal to what one can find elsewhere. As such, he serves as a vital role model for his students. Rabbi Avi Weiss is a very effective, warm-hearted, and charismatic leader who has done wonders in bringing people closer to GOD. He built his shul, HIR, from very small beginnings to where it now has some 600 families as members. A kabbalat shabbat davening there is an experience. All those professionals, both men and women, who fill the shul Friday nights spend 2 hours in their tefilot (They do a full Carlebach style rendition of kabbalat shabbat.) Think of it, after long hours spent during the week in their professional duties, they still devote twice as much time to kabbalat shabbat/ma'ariv davening as do other shuls. Yet, critics keep repeating that LWMO are only interested in leniencies. "This decision, made in the middle 20th century for some reasons which made perfect sense at the time, is definitely harming Modern Orthodoxy's claim to authenticity today. I don't know what can be done, but I think it's worth being aware of the issue. " Complete myth. Western European Orthodox Jews - whether German, English, Dutch, French - you name it, have dressed exactly like the gentiles (sometimes with, and sometimes without, a yarmulke) since the early 19th century, or even earlier - and to an extent that goes for most of the the rabbis too, including the big name ones. I don't necessarily dispute the rest of your point about the appearance of authenticity, only that this is something which began in the United States in the mid-20th century. Mitnagdim are at least in principle following genuine talmidei chachamim, who are well aware of principles of halacha and Jewish tradition and intend only to maintain both. ........On the other hand, chassidut is characterized by their complete disregard for real limmud haTorah and talmidei chachamim. There is no one within the Besht's camp who is a recognized posek, in the sense that a large number of well-educated rabbis ask him for psak on difficult issues and then follow it. It’s a false sense of authenticity. I agree, and I think I more or less said so. The issue is that it 'works', in the sense that it seems to be sufficient to make everyone care what they (or their Rabbanim) think. How about beards and payos? You may have heard of this book Strictly Kosher Reading by Yoel Finkelman about how Artscroll distorts/ hides facts. The subtitle is "Popular Literature and the Condition of Contemporary Orthodoxy (Jewish Identity in Post Modern Society)"
R' Shmiel Shmelke of Nikolsburg, brother of the Hafloah (who also counted himself among the followers of the new Derech HaChassidus and no slouch himself among the Gedolei Torah - witness the regard in which his seforim Makneh and Hafloah on Kiddushin and Kesubos are held until today) was a far reaching Marbitz Torah and Rosh Yeshiva; it was in this capacity that he influenced so many to become followers of the Maggid. By the second and third generation - as Chasidus spread - such Gedolei HaDor - not second tier, but rather known as true Gedolei HaDor - such as the Divrei Chayim, Tzemach Tzedek, Chidushe HaRim were firmly in Chasidic camp. If I remember correctly, he identifies ordination of women, having women lead Kabbalas Shabbos, believing the Lubavitcher Rebbe is mashiach, and opposing Zionism to the extent that the Neturei Karta do as specific practices that fall outside the realm of Orthodoxy, because they're opposed by all talmidei chachamim. I'd like to comment on the discussion over what Jews have worn historically. For most of the past millennium, if not more, Jews have worn exactly what the non-jews around them wore, with the addition of whatever was mandated by the christian/secular laws, such as Jews hats, special badges, or the like. The only times they did not, was either when they were newly moved to an area and wearing the fashions of the land they left behind, or when they became nearly completely separate from the surrounding society and evolved their own fashions. I have always read that the general haredi/chassidish (whatever you want to call it) uniform was descended from the fashions of the polish/hungarian military nobility. There is a very revealing statement on R. Simcha Coffer's analysis of RNS' blogpost. "there are some minimum requirements which must be satisfied in order for one to consider himself a member of TOJ. Chief amongst them is reverence for our Torah leaders." Fascinating. The "chief" characteristic of Charedi Judaism is not reverence for Hashem, not reverence for Torah, not reverence for halakha, not reverence for Emes, certainly not reverence for morality but "reverence for our Torah leaders." RCS's statement goes a long way towards explaining the current divide between MO and Charedi Judaism. Any reason you did not make this comment to RSC directly?? simple reason. I tried to post but rsc's site but it requires a blogger account and I don't have one. Please feel free to post this comment in his site!